Through today’s highlighted course, learn the areas of chaos in Federal Circuit jurisprudence of primary concern to practitioners who prepare and prosecute patents. Join Us for our Fall Advanced Courses Conference! Join us in southern California on October 17-23, 2012 for our Fall Advanced Courses Conference. We’ll be offering 10 outstanding one-, two-, and three-day courses that set the industry standard for advanced patent education. Hyatt Regency Indian Wells Resort & Spa in Indian Wells, CA. Our Fall Conference, which will be held at the Hyatt Regency Indian Wells Resort & Spa in Indian Wells, CA, goes beyond the basics and gives you practical insights that you can apply immediately. And all of our returning courses have been updated as needed to reflect the ongoing impacts on you and your practice of the AIA. We’re also offering a special one-day course focusing solely on the AIA. We’ll help you to avoid the dangers that the AIA poses to practitioners in all areas of patent law. Discuss the implications of the AIA on application drafting. We’re offering an amazing room rate of only $169.00 per night, single or double, plus tax at this conference. This rate is 20% less than what we were able to offer the last time we hosted our Advanced Courses Conference at this venue! Two of PRG’s Most Popular Courses Coming to New York City! On September 10-12, 2012, we’ll be offering Patent Administration: A Foundation for Success. This is a complete and thorough 2.5-day certificate program designed to provide patent paralegals, secretaries, and administrators with a solid understanding of the fundamentals of patent law, as well as practical tips and advice that can be applied on a daily basis to save time and ensure success. On September 10-14, 2012, we’ll be offering our industry-leading Patent Bar Review Course. We provide you with the most comprehensive level of preparation possible, and we are 100% focused on helping you to pass the USPTO bar exam. Today’s highlighted course is updated based on the AIA and demonstrates how chemical claims are constructed and construed. Read on to learn about our popular course on Chemical Patent Practice! Landon IP, in conjunction with Patent Resources Group, is excited to present a training course specifically targeting the needs of patent support professionals. A successful patent operation is dependent on the efforts of many people. The patent attorneys and agents at the center of the process are assisted by a highly skilled and knowledgeable team of support professionals. However, to be at their most effective, these patent support professionals must keep up-to-date on the latest patent administration information — and Patent Resources Group (PRG) has the solution. PRG’s course Patent Administration: A Foundation for Success is a complete and thorough 3-day certificate program designed to provide patent paralegals, secretaries, and administrators with a solid understanding of the fundamentals of patent law, as well as practical tips and advice that can be applied on a daily basis to save time and ensure success. If you are a patent attorney or agent, this is the perfect course for your support team, and we encourage you to share this message with them so that they can sign up for this course. If you are a patent support professional yourself, don’t delay in registering for this outstanding educational opportunity! Time is running out, so anyone wanting to take this course should register today! And you can’t beat the price of $795.00 for this 3-day program. If you have any questions about this course, please contact a PRG registrar by phone at 703-682-4860 or by email at registrar@patentresources.com. Space is Limited for our September Bar Review Course in NYC! If you’re planning on attending our next classroom Bar Review Course, you need to register now! Spaces are limited, and this course is filling up. Don’t miss out on this chance to take our industry-leading Bar Review Course — sign up today and join us in New York City on September 10-14 at the Concierge Conference Center! We have already updated our course to reflect the latest changes to the registration exam, based on the new source materials announced by the USPTO earlier this year, some of which reflect the impact of the America Invents Act (AIA). If you prefer to study at your own pace, or want to supplement your classroom experience, you can purchase our online video course. With both the classroom and online video options, you get FREE access to ExamWare®, our highly-acclaimed online patent exam preparation software. Sign up today for our September 10-14 course in NYC! 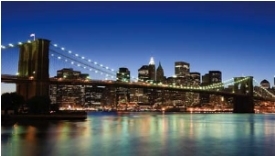 The September Patent Bar Review will be in New York City.